This Creamy Vegetable Tilapia Recipe is such a crowd pleaser! 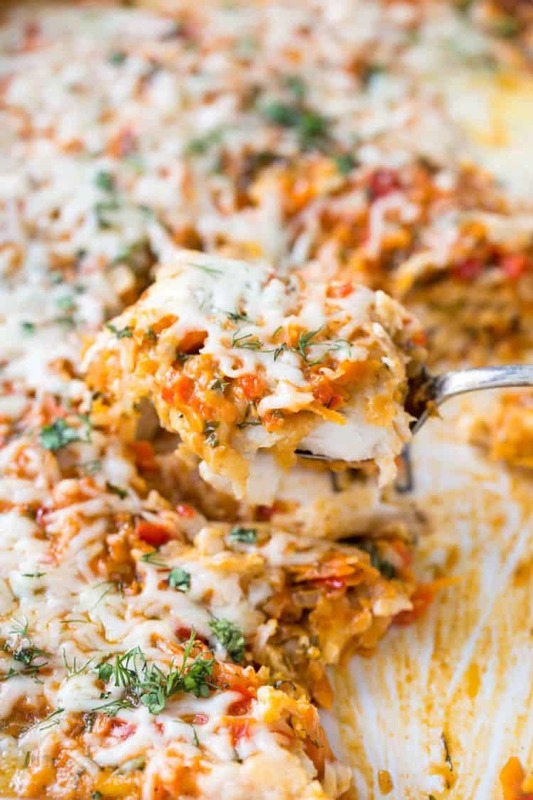 Tender tilapia fillets under a bed of creamy vegetables and herbs, topped with cheese and baked! The flavors come together and create a delicious seafood casserole. This tilapia recipe is going to beat any recipe you’ve ever tried, true story! Cooking tilapia itself may taste bland at times. However, in this recipe, the battered and fried tilapia fish itself is so crispy on the outside yet flaky and tender on the inside. The onion, carrots and peppers are sautéed until tender. Then the vegetables are then combined with a cream and ketchup mixture, added with fresh dill and cilantro to give the creamy mixture a taste that’s indescribable. Lastly the vegetable mixture is spread over the tilapia in a casserole dish, topped with shredded cheese and baked. This is the perfect dish to make for a party or get together. Everyone will rave and ask for the recipe! Tilapia fish is a common name for the many different species of the cichlid tribe fish. It mainly inhabits lakes, rivers and shallow streams. It is an inexpensive fish to purchase and catch as it can be caught in artisanal fishing. Though tilapia can be cooked quickly in a skillet, it may also be baked in the oven. 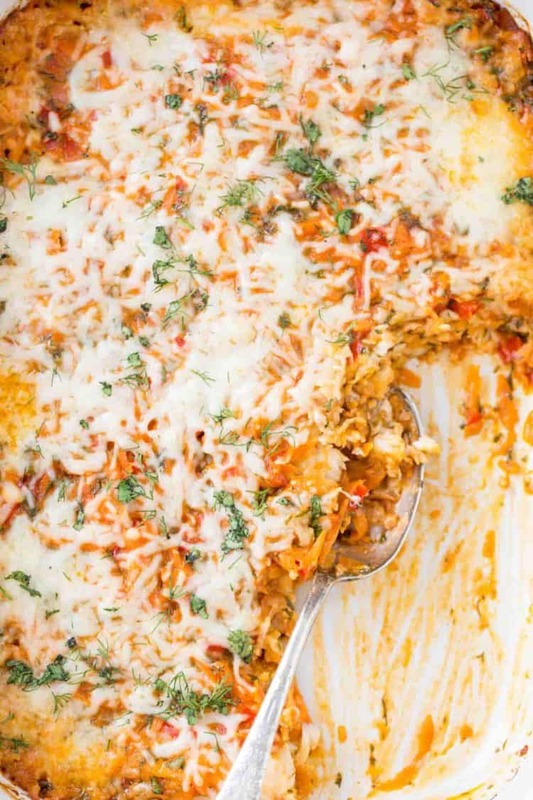 This oven baked tilapia casserole is going to become a seafood casserole favorite! Can the herbs be substituted? Though I use a combination of fresh dill and cilantro in this tilapia casserole, you can use your favorite herbs. A combination of dill and parsley will work, or even parsley and cilantro. Herbs are an important part of this recipe so don’t skimp on them! Can the Tilapia with Vegetables be made in advance? Yes! This is the perfect dish to prepare in advance, even the day before. Then llow the fried fish and sautéed creamy vegetables to cool completely before assembling adding all of the ingredients to the casserole dish. Prepare recipe as indicated and refrigerate covered before baking. The dish may need an extra 5 minutes of baking time since it will be cold. I hope you loved this recipe. If you make it, don’t forget to tag us on social media, #ValentinasCorner. I just love seeing your creations! Tools used to make this Tilapia Recipe: grater, casserole dish, skillet. Buttered Cod– Simple and delicious dinner! Flounder with Vegetables Recipe– Another great seafood recipe. Blackened Tilapia Fish Recipe– A light and simple tilapia recipe! Fried tilapia fillets under a bed of creamy vegetables and herbs, baked and topped with cheese. This seafood casserole is perfect! Cut fillets in half lengthwise. In a medium bowl, combine ingredients for the milk mixture. In a separate bowl, combine ingredients for the flour mixture. Dip each fillet into the milk mixture and then generously coat in the flour mixture. Add enough oil to the bottom of a large skillet to cover skillet. Once the oil is hot, add the fillets. Fry until golden. Repeat with remaining filets. Set aside. In a large skillet, on med/high heat, add 2 Tbsp olive oil and chopped onions. Grate the carrots. Cube peppers. Add to onions. (Add more oil if the skillet is dry) Saute about 5 minutes. 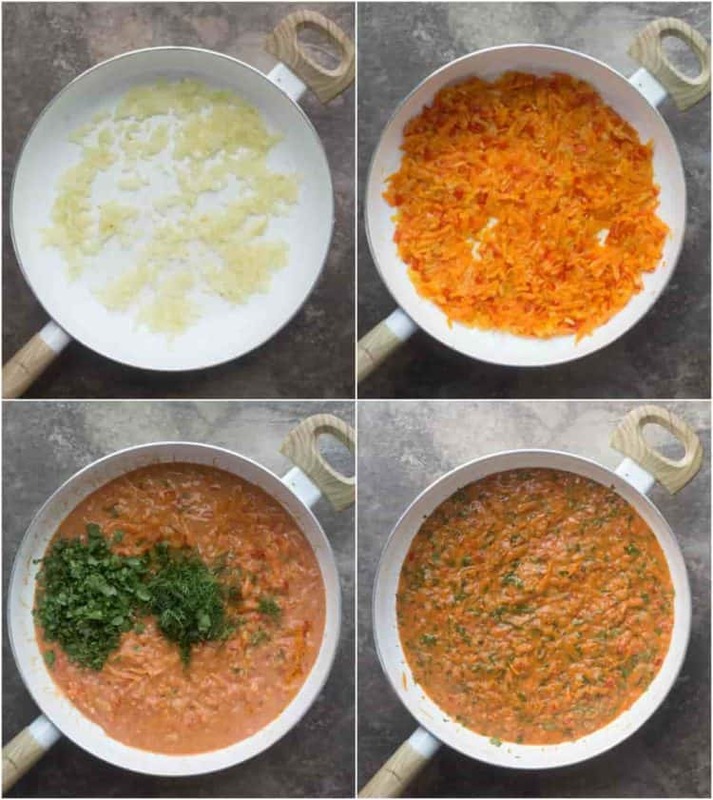 Once vegetables are tender, add minced garlic. Add to the vegetables and bring to a simmer. Add chopped cilantro and dill. 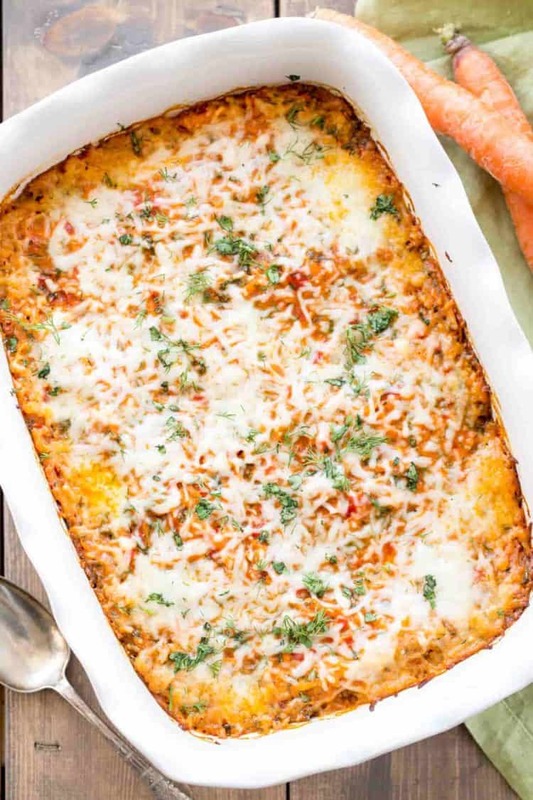 In a 9"x13" baking dish, cover bottom with a thin layer of the vegetable mixture. Add the tilapia into casserole dish. Completely cover the tilapia with the remaining vegetable mixture. Sprinkle with cheese. (If you are not a fan of cheese, omit completely). Bake in preheated oven to 375°F for about 25 minutes. Remove foil and bake another 10 minutes or until cheese melts and begins to brown and bubble. Tilapia should cover 9x13 pan in one layer. Made this yesterday and it was a hit, kids and hubby loved it! Always a good thing 🙂 definitely a keeper! I’m not a fan of cilantro so I didn’t add any but still happy with the results! Thank you so much for sharing it! That’s so awesome to hear, I am so glad your family enjoyed this. Though I think we are extremely overdue to update the pictures on this old recipe. 🙂 So glad the pictures didn’t throw you off:). Made this today. It was delish! Will be making it again. Thank for this recipe! Thank you Tanyush for trying our recipe, I’m so glad you enjoyed it. It’s definitely a favorite of mine as well. Prop one of top 5 recipes I love☺.. Thank you Innochka for the lovely feedback.. I must admit, I LOVE this recipe too (minus the outdated pictures?). Especially the aroma when adding the herbs into the veggies, Mmmm. Got me craving some now.. Blessings to you and your family!..? What do you normally serve this dish with? Made this the other day. We enjoyed it! Thank you! Can’t wait. Still have to get tilapia fillets though. It’s definitely going in my “to cook” list. 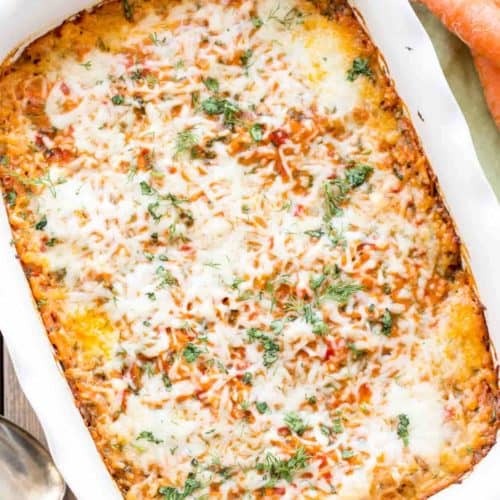 Oh totally do everything the day before and bake it right before serving the following day:]… You will love this dish, it’s one of my favorite dishes to make for guests.. Thanks for your feedback. Love hearing those:0).. Have a lovely party.. I have heard that too. I think that implies more to like drinking milk and cilotka together..:) That sounds gross, though I have friends that do that. Been making this for years and never had a stomach issue:)..
Made this fish twice already. It’s so delicious. I will take that as a compliment..:) We love it too.. Glad you enjoyed it..